The plasma surface metallurgy is a new discipline field in materials science and engineering. 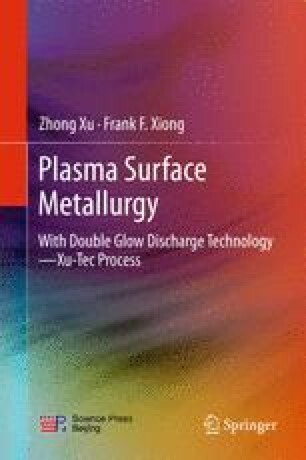 The newly developed surface metallurgy technology, Double Glow Plasma Surface Metallurgy Technology, or the Xu-Tec process, applies a series of physical processes, such as vacuum, gas discharge, low-temperature plasma, ion sputtering, surface adsorption, and atomic diffusion, to realize a surface alloying layer into the surface of the substrate matrix. This chapter introduces some basic knowledge and physics about the double glow discharge and the processing characteristics as well. Some preliminary discussion is presented on the related physical fundamental issues that involved in the Xu-Tec process.